Monday Morning Moment. 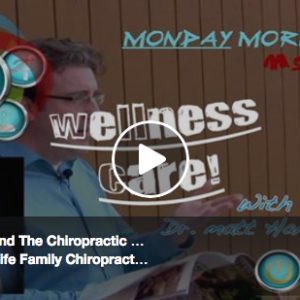 Episode Wellness Care and The Chiropractic Approach. A century ago, infectious diseases were the health crises of the day. Researchers broke ground with treatments and cures. Populations underwent radical improvements in lifestyle, such as sanitation, clean water and improved nutrition. Today, we no longer fear illness as previous generations did, yet we still do not consider our era to be one of health. In place of infectious diseases, we have chronic maladies. Tuberculosis and pneumonia have been edged out by diabetes, chronic respiratory illness, and cancers. While much attention and fundraising is devoted to a search for the cures for these modern killers, some have questioned whether we are looking for the right solution at all. A different approach, True Wellness Care, could be the public-health breakthrough of our time.